Earlier today I asked people on Twitter for recommendations of good early-access games, and one that came up was SpeedRunners, described as a "cut-throat multiplayer running game". I'd never tried it, but now I can without even spending any money, because it's free to play on Steam this weekend. 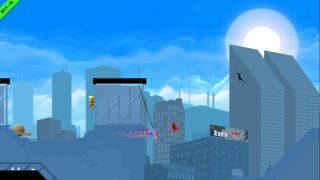 SpeedRunners is being developed by Dutch developer DoubleDutch Games and published by tinyBuild. It's a colourful fast-paced same-screen multiplayer game in which you run, jump, and swing through levels while using weapons and other items to prevent your opponents from doing the same.